ROME, GA (Apr 2019) Northwest Georgia’s favorite family fall event shifts timing for the 2019 Wings Over North Georgia Air Show to Labor Day weekend, August 31-September 1. The eighth annual event will take place at Russell Regional Airport in Rome, GA and is presented by JLC AirShow Management. There are a number of first-time appearances by performers. 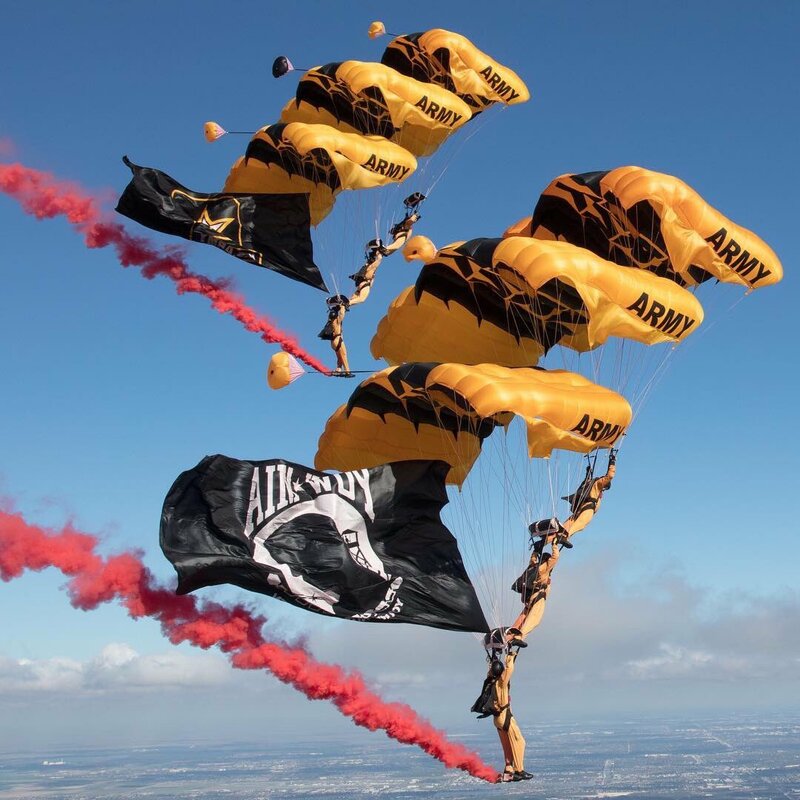 The U.S. Army Golden Knights Parachute Team will “Jump In” for their inaugural visit to the show. Members of this elite group of skydivers have performed and competed for more than 50 years at more than 16,000 shows. Greg Colyer will join the lineup in his T-33 Shooting Star he calls “Ace Maker”. The T-33 was first introduced as a training aircraft in the late 1940’s and was a variant of the P-80, both designed and manufactured by Lockheed. The aircraft was used as the primary advanced trainer for all Air Force pilots for nearly twenty years. Greg has thrilled audiences with his performances at air shows in Ace Maker since 2008. Redline Airshows is a dynamic 2-ship formation aerobatic performance team. The Redline Team flies the Vans RV-8 homebuilt aircraft. These two-seat, tandem aircraft are extremely versatile and capable of speeds up to 230 miles per hour. The two aircraft interact with each other in a variety of formations including opposing and inverted maneuvers. On the ground, air show attendees will have the chance to witness the fierce triple jet power of the Jerry McCart and the “Homewrecker” Jet Truck. Three afterburners light up the runway as McCart races past the crowd. More than 36,000 horsepower is produced from the 18,000 pounds of thrust in the afterburners. Take advantage of the early discounts for advance purchase tickets for the Wings Over North Georgia Air Show at www.WingsOverNorthGeorgia.com. Premium seating and family ticket packages are available with on-site reserved gold airport parking options. Guests interested in on-site camping options for the show can choose between premium infield and standard dry camping options. Airport parking lots will open at 8:00 a.m. with the gates opening to guests at 9:00 a.m. on Saturday and Sunday. The opening ceremonies will kick-off each day at 12:30 p.m. followed by the first flying performances at 1:00 pm. The Wings Over North Georgia airshow is an FAA, DoD, and International Council of Air Shows recognized event. For the full list of performers, activities, and ticket options - air show fans, exhibitors, vendors, and sponsors can visit the official Wings Over North Georgia air show website.